Do you wonder why people have prejudice against canned and frozen vegetables? Probably because you no longer taste the freshness of your food. But what if there's no time to prepare those lentils or chickpeas you've been craving for? Or if chopping those onions are infecting your tearducts? I might have the answer. 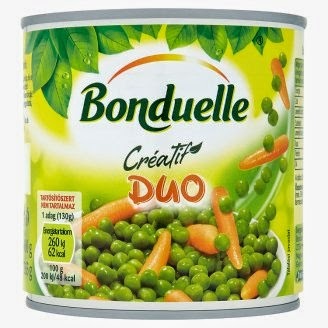 A French company named "Bonduelle" provides you with canned and frozen veggies tasting like the real stuff. No one could tell your homemade hummus was canned just minutes before. That quality enabled them to become Europe market leader for tinned vegetables and the number two in frozen veggies. - AND.........a perfect price/quality ratio. Last week I created my very own "hot tomato spread", using Bonduelle's white beans. It only took a few minutes of preparation. No wonder it has already become my favorite "ready in 5 minutes" - meal.